All wine enthusiasts will attest to the importance of having their wine served at the optimum temperature. This not only helps in preserving the flavors but also keeping it refreshingly fresh. If you are a wine enthusiast who is looking to buy a wine cooler and end the days of storing your wine in the refrigerator or even worse, regular kitchen cabinets, you need to read this carefully. The best wine coolers not only provide you with the right storage conditions for your wine, but also enhance your wine drinking experience at the least. If you are tired of just buying a couple of bottles of wine for immediate consumption due to lack of storage space, then you will need to think about getting a dedicated wine cooler instead of cramming bottles into the fridge every other time and cooling it so much that it loses its rich offering of flavors. EdgeStar’s TWR215ESS offers enough space to comfortably accommodate 21 wine bottles. These can be of any size without affecting the total capacity. You can store regular 750ml bottles or larger broad shouldered bottles. When you begin your search for the best wine cooler for a small collection, you will not only be concerned about the features but also the design. Since most beginners and small scale collectors do not have space for large coolers or wine cellars, the cooler will most probably find its place on the kitchen counter. Here, an appealing design is essential. You will want the TWR215ESS cooler since it boasts a standout eye catching design. The unit comes with a tapered glass door and a stainless steel detail. The cool internal lighting comes in the form of a blue light that further enhances this look. You can bet that your wine collection gets a fittingly modern and attractive display. When shopping for wine coolers, you will come across single and dual zone coolers. All that this means is that the wine can be stored in different compartments at different temperatures depending on type. As an avid wine drinker you will probably know that the optimal storage temperature is not the same for both reds and whites. So if you are looking to store your wine for longer and ensure its quality is preserved to the highest degree, you can simply get EdgeStar’s TWR215ESS Cooler. This wine cooler comes with a dual zone capability to ensure that your reds are stored at the optimum temperature of 54-66F; while whites are stored at a lower 46-66F. One of the stand out features of this unit is the vibration free thermoelectric cooling. 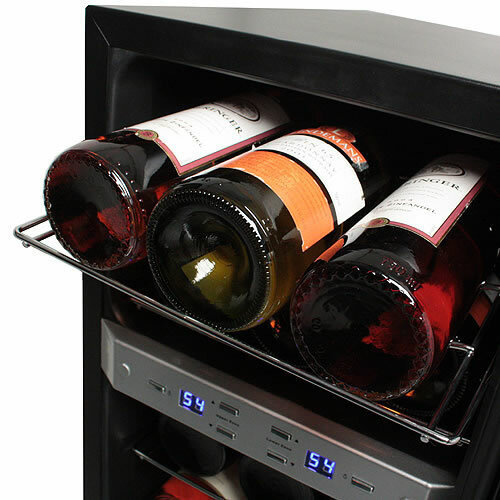 The wine cooler uses cutting edge cooling technology to cool the air within. This gets rid of the traditional cooling mechanism that has been known to consume more power and produce a substantial amount of noise that’s quite annoying especially when the cooler is placed in a silent room such as the living room. With this new energy efficient and relatively silent cooling system, you can place the unit anywhere in your house depending on your preference and space availability without worrying about any noise produced. To keep the cold air in and warm air out, the unit comes with double panned tempered glass for maximum insulation capabilities. Efficient cooling is all about keeping the warm temperatures out and the cooler temperatures in. This is captured well in EdgeStar’s TWR215ESS design. Still on the cooling front you will want to know that the unit comes with an air distribution fan to keep the air inside the unit moving. This is essential in ensuring that the bottles inside are cooled uniformly regardless of where they are placed in the unit. In addition the unit comes with high quality durable chrome shelves which are easily removable when necessary. Temperature display and controls are digital for easy and convenient operation. The upper zone, which supports lower temperatures accommodates up to six bottles of white wine, while the lower zone, supports relatively higher temperatures. It accommodates up to 15 bottles of red wine. 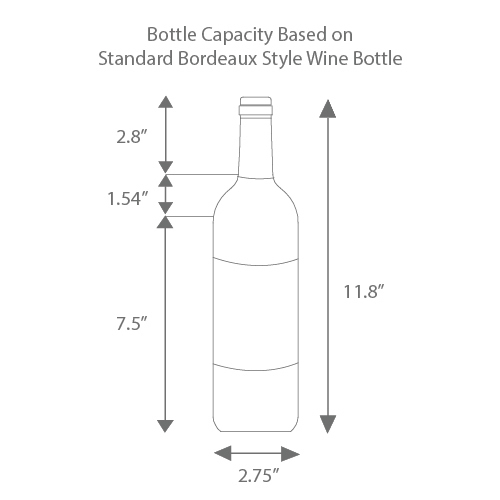 This unit is great for someone looking to store more that their weekly supply of wine. It provides enough space to begin your own small collection in preparation of larger collections in future.